If your company is like most, you have a desk somewhere in the building with a tangle of cords and modems underneath it that send WiFi signals so your team can use the Internet. The farther away the receiving devices, the weaker the signals. Extending this system requires another bunch of cords and modems attached to another outlet. Is Wireless Power Transmission Just Like That? Not Exactly. Wireless power technology like Cota sends energy safely and wirelessly via a transmitter like a WiFi modem, but you have the option of removing the obstacle of the modem itself. That’s because the Cota Transmitter can be any shape at all: a picture frame, a ceiling tile, a flower vase, or a decorative wall piece. The opportunities for shaping the transmitter into something pleasing, useful, or practically invisible are endless. What’s more, all of these transmitters can be easily linked to extend the reach of the wireless power delivery throughout your facility. Large hospitals, factories, warehouses, shopping malls: install Cota Tiles (or whichever shape the manufacturer makes) with usage and location in mind, so that no matter what or where the charge is needed, the right amount of power will be there when they need most. Fun fact? At CES 2017, Ossia was awarded a “Best of Innovation” title for Cota Tile. How Is Real Wireless Power Different Than a Charging Mat? The Cota Transmitter uses a completely different technology than a charging mat or charging pad. Charging pads that use Qi, and inductive technology, require the user to stop using the device and put it down. Mats are useful in break rooms and dining halls, but not so much when your staff or customers are on the move. Qi is limited to transferring energy over a very short distance, about one and a half inches. It’s almost a one to one relationship: one charging mat needed per person or per device. That provides quite a bit of freedom and convenience to not only consumers with their smartphones and wearables, but also the makers of connected IoT, industrial warehouses, and auto manufacturers. The Cota transmitter, built right into the dash of a car, for example, can power hundreds of safety sensors and comfort settings throughout the vehicle. Visitors to your Cota-powered space can enjoy automatic charging without finding an unoccupied charging mat and without the concern of leaving their device unattended. 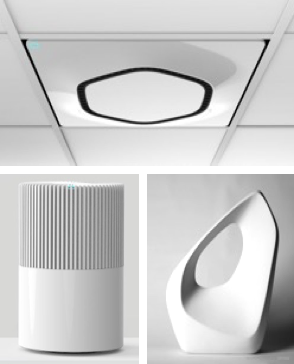 So why are so many companies like Apple and Samsung embracing Qi “wireless” technology instead of something more flexible and convenient like Cota smart antenna technology? It’s just a matter of time. Qi has been one of the first hurdles in wireless power adoption, and as companies continue to innovate their products and become more involved in the entire wireless power ecosystem, more opportunities for partnerships and growth in real wireless power will become available. It’s an exciting period in wireless power history. Who will be the first early adopters of real wireless power?